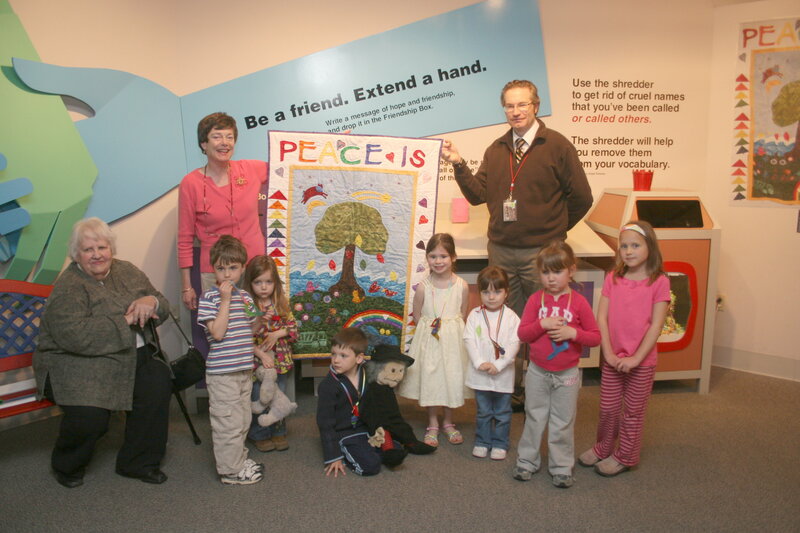 This entry was posted in art, Early Education, Imagination, Inspiration, museums, Peace, quilting, The Arts, Writing and tagged "God Bless America", Imagination, Inspiration, Milly the Quilter, National Liberty Museum, quilting, Quilts and museums, Teaching children. Bookmark the permalink. What a great story, and the personal details divulged by Milly were just fascinating. This is ‘misty-eyed’ reading of the highest order, Jennie. I certainly appreciate that, Pete. It means a great deal. Best to you. What a thing for children to experience! It was incredible. Thank you! Life without art and imagination, is not living… Great post! You are exactly right about life, Lea. Thank you! I’m so glad you’re enjoying the story, Darlene. Thank you. Stand by for the next quilt and an aircraft carrier!! Seriously. Fantastic story Jennie. I’m not surprised they wanted it. It is beautiful and so meaningful. Millie the Marvel!! Thanks so much, Opher. Milly really is a marvel. More marvels to come! What a super story, Jennie. You have me hook, line, and sinker. Can’t wait for part five. Now, coming from you that’s as good as it gets, John. I’m so glad. Thank you! What a meaningful and extraordinary saga you are sharing with us! I heard a radio program recently in which children who had taken part in a 25 mile peace/social justice march were interviewed about how this affected the trajectory of their lives. Many of them had grown up and found work in various social justice causes as adults. Who knows what seeds this project may have plants in the hearts and souls and minds of your students. I also love that you wrote thank you letters AND that you sing a lot in class! Thank you for this installment! This is the latest installment of the legacy of millie story by Jennie! This was an unexpected and wonderful twist in the story, Jennie. It’s amazing how much love and passion was shared in making and giving that quilt to the museum. I’m looking forward to Part-5. Oh my. I love aircraft carriers…this story keeps getting better. The true story of Milly, Gloria, and these gifted children, that you have shared so touchingly and written beautifully; now has wings that touches everyone and opens hearts as it raises us up from the quagmire of the mundane to view something of great beauty, a Peace Quilt, created by the true artists of the world, children. Breathtaking. Thank you, Karen! Your words are so beautiful, and much appreciated. And yes, children are indeed the true artists of the world. I forgot to mention that really passionate quilters who put so much of their heart into their work, buy quilt grade fabric and Jo Ann’s does not have that. They carry crafting grade fabric. A world of difference to the touch. That she sewed the entire thing by hand is also quite impressive. Not something I could do and it’s a dying art form. So, another tissue was required here. I laughed at Milly being the other woman and was warmed at seeing Grant carefully sharing his experiences with Gloria. One simple gesture touches so many so much. This is a story for a book. You know it too. I have a sixth sense about those things Jennie. If you put the energy out there, it will be quite successful. I can see that you do, Marlene. Terrific! Wow! I’ve just read parts 1-4 and I have joyful tears! What a wonderful experience and something you will all remember! I can’t wait for the next part! How absolutely wonderful, Jennie. You are an exception teacher and Millie was an exceptional quilter. How marvelous that the museum was so interested and supportive. Wonderful is the perfect word, all the way around. Thank you, Robbie. So many storylines…the saga of the peace quilt itself is interesting of course, but the threads of lives in different stages of life – especially bringing multidimensions to a generation that too often gets stuck in stereotypes Aw heck, I’ll just say it: Milly!!!!! “The other woman” hilarious, but serious, too, ya know? 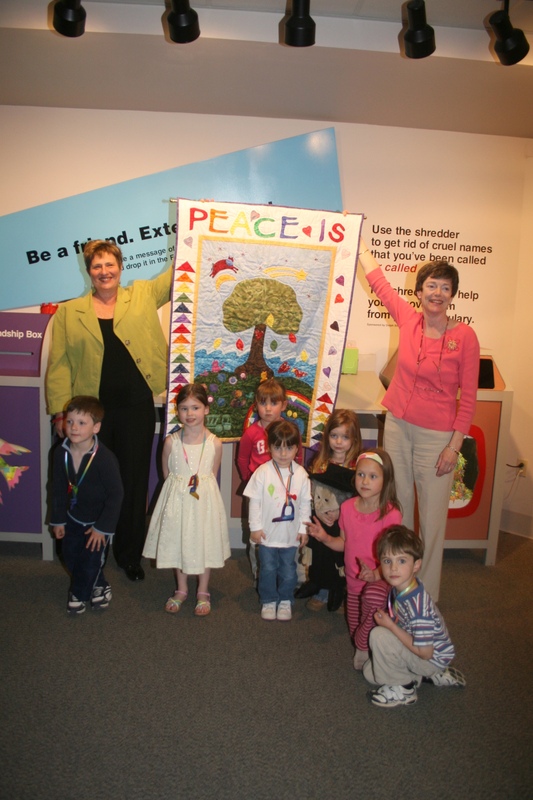 You have a gift for writing what is hard to express – the interconnectedness of life in multiple lives – joined together by a Peace Quilt. Wonderful and congratulations to all of you! What a wonderful blending of stories, of emotions, of joy, of peace, Jennie. You look very justifiably proud of the quilt, your children, Milly, Gloria, and you! It felt like a blend of every emotion. At last the quilt came to rest! And so beautifully and appropriately. Thank you Janice. Happy reading!